The Dandenong/Cranbourne RSL Sub Branch was formed by the amalgamation of the Dandenong and Cranbourne Sub Branches in 2009 and provides members and guests the use of two venues at the Dandenong RSL and the Cranbourne RSL. Eight black and white photographs depicting the aftermath of an atomic bomb explosion in Japan, probably Nagasaki or Hiroshima. Four photographs depict injured or deceased people. The photographs appear to have been taken in the days after an atomic bomb explosion in Japan. The bombings of Hiroshima and Nagasaki occurred on the 6 and 9 of August 1945. 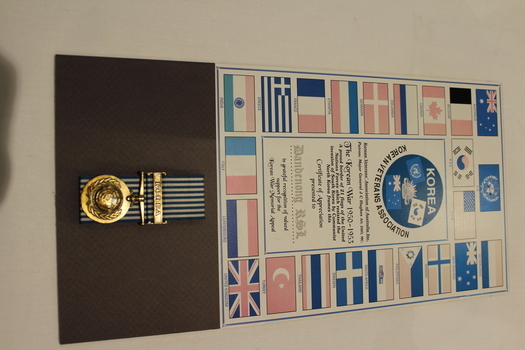 Korean Veterans Association of Australia Inc. Donated to Dandenong RSL by Major General J C Hughes AO DSO MC. 9th Australian Division Cavalry Regiment Christmas Card from Middle East December 1942. 57/60 Battalion AIF Invitation to "Welcome Home Dance" St Kilda Town Hall. Tuesday 21st May 1946. 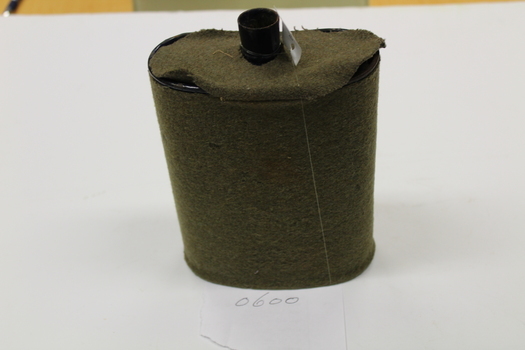 Metal water canteen with khaki felt cover. 08 pattern. 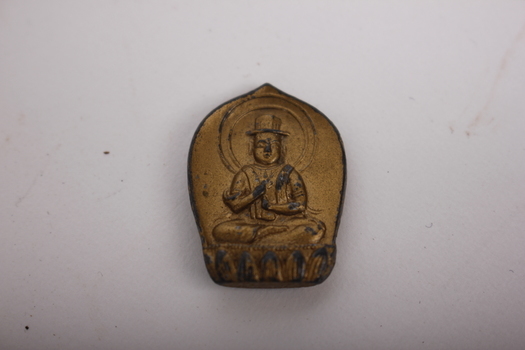 Front has a Sitting crossed legged Buddha? Rear has writing possibly Japanese? Dark green metal tube of apricot jam. Part of an Australian ration pack. Tube has a black plastic lid. This jam tube is part of an Australian ration pack, possibly from 2002. Ration packs are provided to soldiers and contain daily necessities such as food, matches and tobacco. 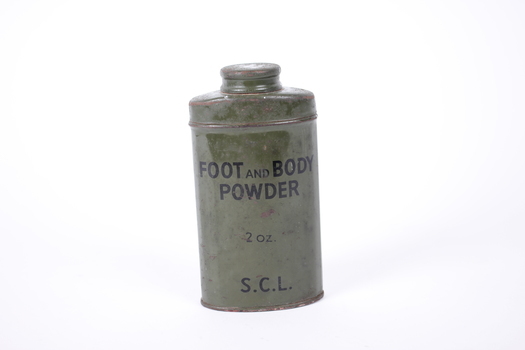 These items were found together in a showcase at Dandenong RSL, suggesting that they came from a single ration pack. Ration packs are significant as they represent the daily life of military personnel. 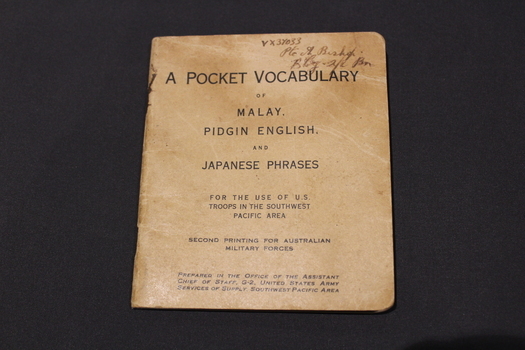 Pocket book - A Pocket Vocabulary of MALAY PIDGIN ENGLISH and JAPANESE PHRASES. Square pocket book for the use of united States troops in the Southwest Pacific Area. 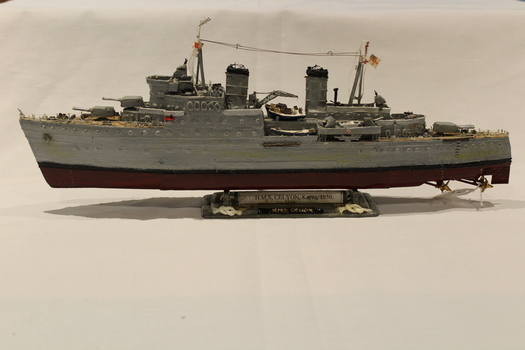 VX37033 Pte A. Bishop B.coy 2/2/Battalion is written in ink on the front cover. 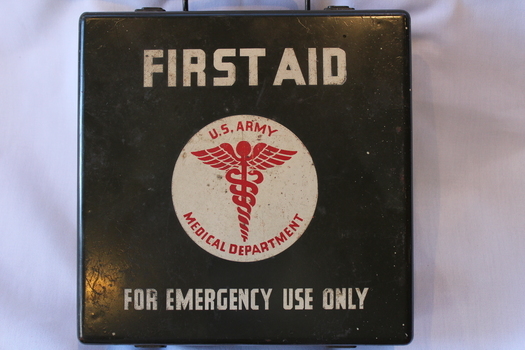 U.S.ARMY FIRST AID KIT FROM WWII FIELD DRESSINGS, SAFETY PINS AND DIFFERENT DRESSINGS.OUTSIDE OF TIN. 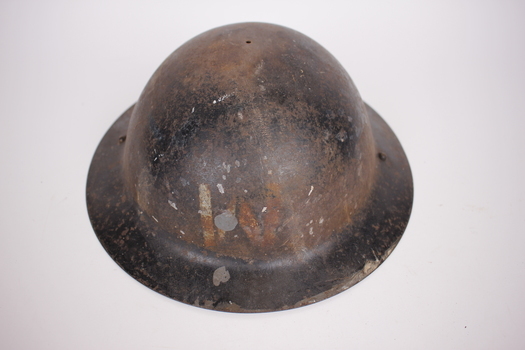 INSCRIPTIONS READ: U.S.ARMY MEDICAL DEPARTMENT. FOR EMERGENCY USE ONLY. Rail slice- Thai Burma railway. T shaped railway line slice from the Thai-Burma railway line 1942-43. 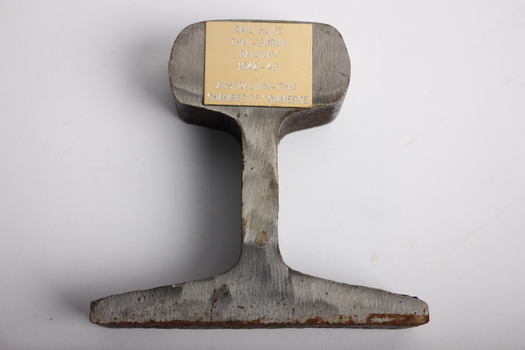 No markings on actual railway line slice but plaque attached Rail slice thai-Burma Railway !942-43 Australian-Thai Chamber of Commerce. 2 x circles printed on either side numbering 20 to 160 .Some Japanese writing on sides. In centre has number 20K - 30K. H = 100/V =180. 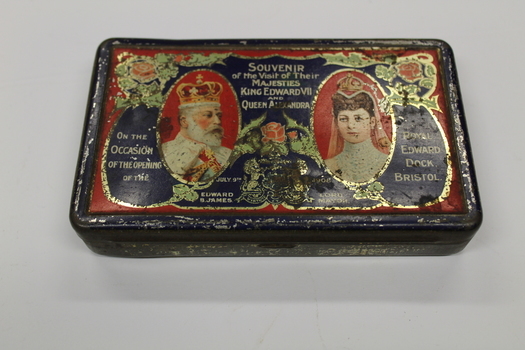 Souvenir tin of the visit of their Majesties King Edward VII. and Queen Alexandria. Issued on the occasion of the opening of Royal Edward Dock Bristol. Issued on the 9th July 1908. Showing King and Queen on lid. On bottom of tin J S FRY & SONS Ltd Chocolate and cocoa manufacturers to HM THE KING - HM THE QUEEN & H.R.H THE PRINCE OF WALES. 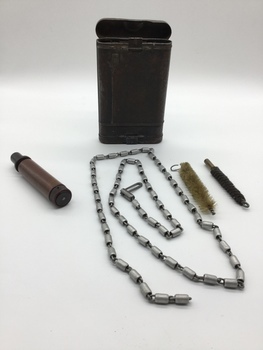 Metal container containing gun cleaning equipment. Round brushes x 2. Gun oil container. 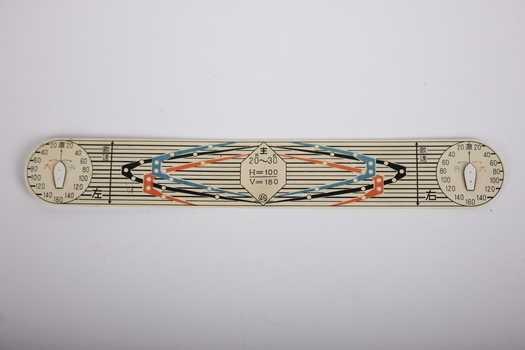 Length of aluminium linked chain. The rifle cleaning kit is for the Mauser K98 rifle. The K meaning " Karabiner ". The calibre is 7.92 x 57mm . This rifle was adopted on the 21st June 1935 as the standard rifle used by the Wehrmacht. 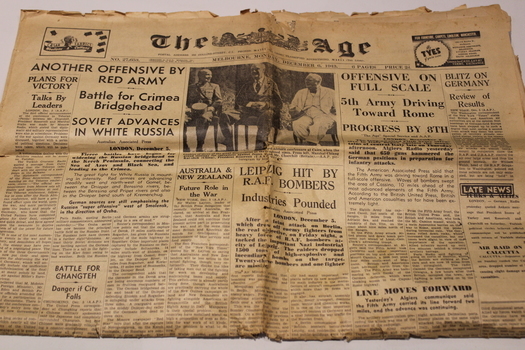 Original edition of the Age Newspaper dated Monday 6th December 1943. Featuring historic conference at Cairo with Marshal Chiag Kai -Shek (China), President Roosevelt (USA), and Mr Churchill (Britain). Other headlines on front page are: "Plans for Victory"; "Offence On Full Scale"; "Blitz on Germany"
Foot & Body Power 2oz. 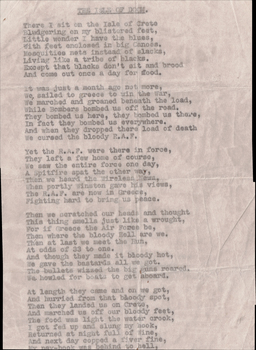 Poem by unknown soldier on 2 pages of white paper. Text written using typewriter. 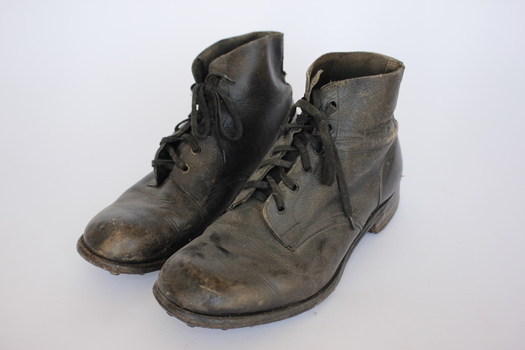 VX 27898 Corporal Thomas John Morris Thomas (Tom Thomas) donated several items to Cranbourne RSL. 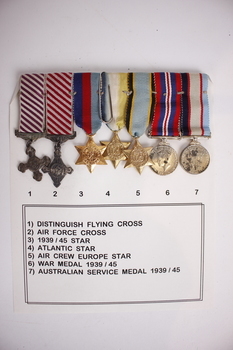 He served in the Australian Corp Signals in WWII both in Australia and overseas. He was born at Womerah on 9/11/1906 and died at Koo Wee Rup 16/06/1984. He enlisted at Yarram on 1/7/1940 and was discharged at Royal Park on 9/3/1945. 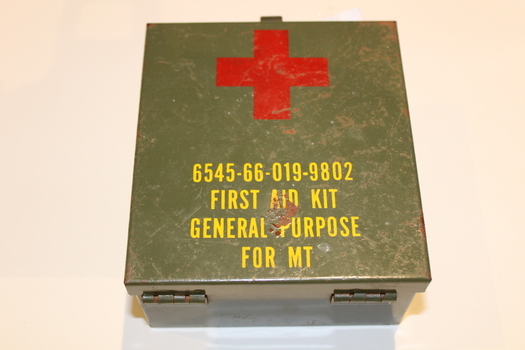 6545-66-019-9802 First Aid Kit General Purpose for MT. Black and white photograph of a young male soldier in uniform. Post card on back with typed and handwritten text. 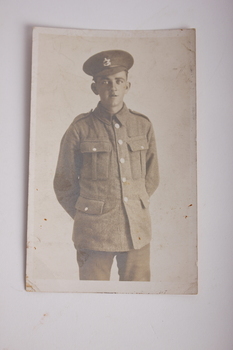 Photograph of Private Frederick Corkish, service number 46656, who served in the 19th Kings Liverpool Regiment in the British Army during WWI He was from Ramsey, Isle of Man. He was taken Prisoner of War in Germany in 1918. Back: "From Freddie / To Jim" "Fred Corkish / aged 18 years / 1916"
WWI German Steel Bayonet with wooden inserts in handle Metal Scabbard. Black wallet in a white cloth envelope addressed to Mrs W.C. Smith, Leongatha, Vic. 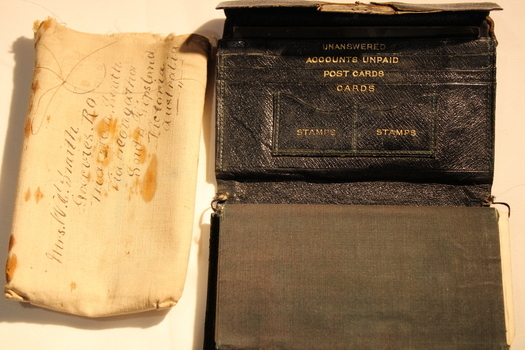 Wallet contains 2 x small photos, a 1916 calendar, a lock of hair, photos of wife and child. and an Army form 'B' pass. Wallet belonged to 382 Pte W.C. Smith. Letter from Mrs Smith on postcards. Envelope addressed to Mrs W.C. Smith, Leongatha, Vic. 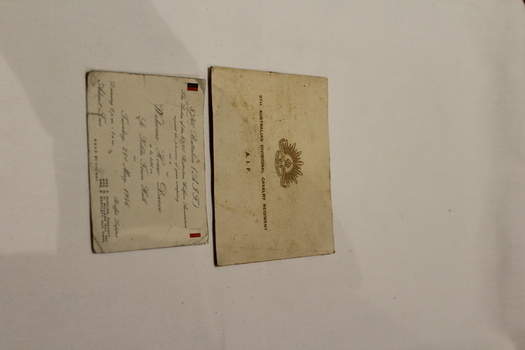 Photos contain letters on rear for Pte Smith. 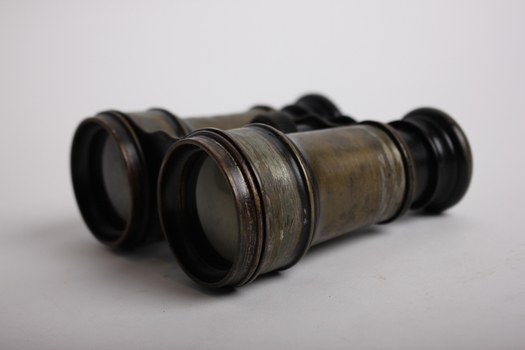 Small pair of binoculars appears vintage. No markings or identifying marks.Appears to be made from aluminium or metal alloy. Water Bottle - AL064 WWII M1910 Water Bottle. 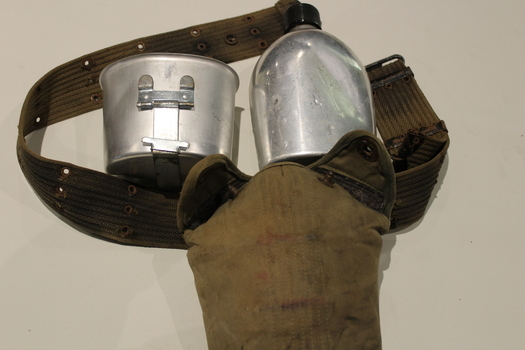 Water bottle " Aluminium" and canteen cup with canvas cover and British webbing belt. 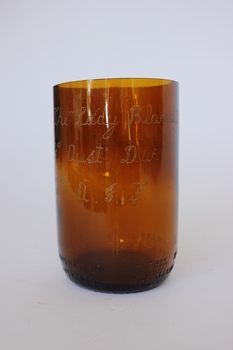 Beer Bottle with top cut off and engraved. Three military operation and maintenance handbooks including Mechanical Vehicle Training, Tractors, Artillery and Tyres Care and Maintenance. 1. "Notified in G.O's, dated 31st July, 1942/ *NOT TO BE PUBLISHED/The information given in this document is not to be communicated, either directly or indirectly, to the Press or to any person not holding an official position in His Majesty's Service/ MECHANICAL VEHICLE TRAINING/PAMPHLET No.1/DRIVER'S ROUTINE MAINTENANCE/1942/Crown Copyright Reserved/*A.M.R. & O 1588 B./Allied Land Forces Headquarters,/May 1942/ By Authority: W.A Hamer Pty. Ltd, Printers." 2. 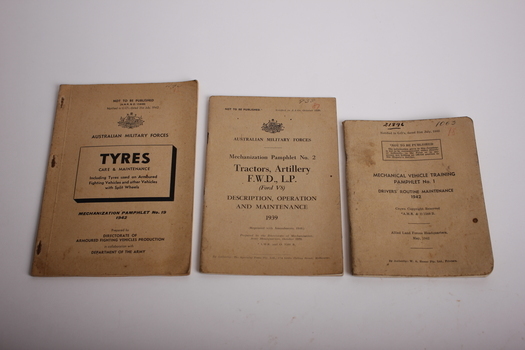 "NOT TO BE PUBLISHED Notified in A.A.Os, October 1939/AUSTRALIAN MILITARY FORCES/ Mechanization Pamphlet No.2/Tractors, Artillery, F.W.D., L.P (Ford V8)/DESCRIPTION, OPERATION/AND MAINTENANCE/1939/ (Reprinted with Amendments, 1940)/ Prepared by the Directorate of Mechanization, Army Headquarters, October 1939./ *A.M.R and O. 1588 B./ Bu Authority: The Specialty Press Pty Ltd., 174 Little Collins Street, Melbourne" 3. "NOT TO BE PUBLISHED/ (A.M.R. & O. 1588B)/Notified in G.O's dated 31st July, 1942/ AUSTRALIAN MILITARY FORCES/ TYRES/CARE & MAINTENANCE/ Including Tyres used on Armoured Fighting Vehicles and other Vehicles with Split Wheels/ MECHANIZATION PAMPHLET No. 19/1942/ Prepared by/ DIRECTORIATE OF ARMOURED FIGHTING VEHICLES PRODUCTION/in collaboration with/DEPARTMENT OF THE ARMY"
Full size brass casting of machete in sheath.